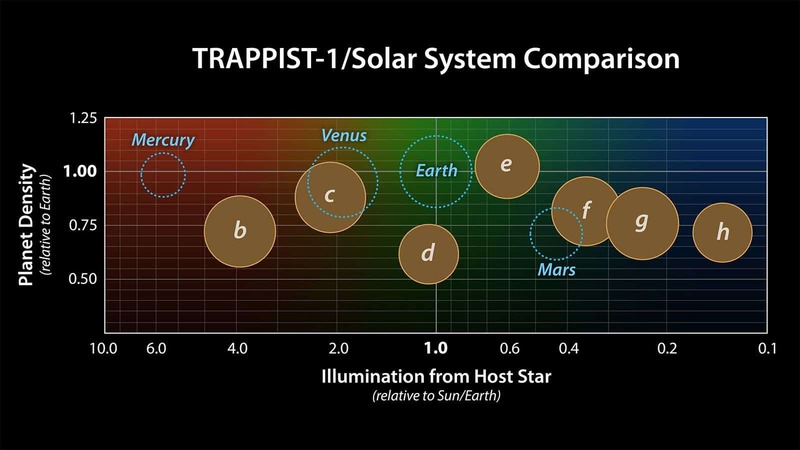 Researchers from Bern University have performed the most accurate calculation of the density of the seven planets around the star TRAPPIST-1, making them the best-studied planets outside our own solar system. They found that all the planets are rocky and contain 5% water — much more than what Earth has. An artistic depiction of what the seven planets might look like, based on available information about their size, density, and distance to the star. Credits: NASA/JPL/Caltech. TRAPPIST-1, also technically designated as 2MASS J23062928-0502285, is a seemingly inconspicuous ultra-cool red dwarf star. 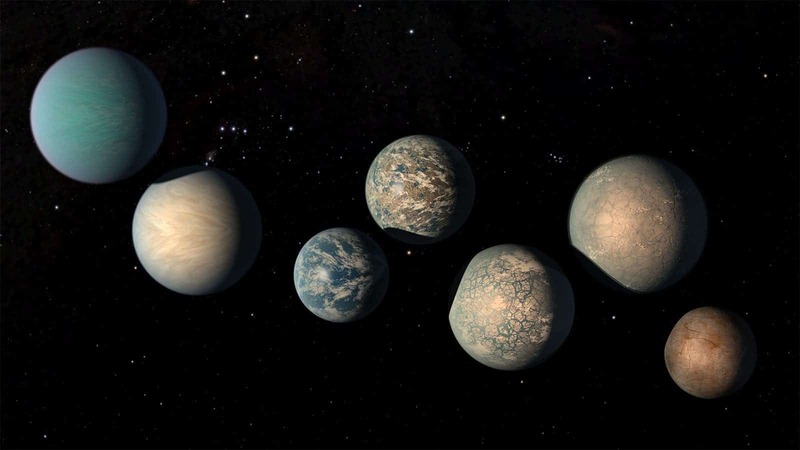 However, astronomers have taken a special interest in it, as it seemingly harbors seven Earth-like planets, several of which have the potential to host life. Now, a new study offers an unprecedented view into the physical and chemical characteristics of these planets. In order to assess their density, astronomers took advantage of something called “transit timing variations,” a method which has also been used to detect planets. Essentially, when a planet passes in front of a star, it causes a dip in luminosity. By studying that dip, you can identify a planet and its size. But astronomers went even deeper. The TRAPPIST planets are located very close to each other — if you had an observer on one of them, they’d have a pretty awesome view of at least a couple other planets. But this also means that they attract each other gravitationally. If a single planet were to rotate around the star, or if the planets were too far apart for gravity to make a significant difference, a planet would always cross in front of its host star at consistent intervals of time. But because they’re so closely packed, they change the timing of each other’s “years” ever so slightly. This allowed astronomers to deduce the mass of the planets with an uncertainty less than 10%, and with the size and the mass, they calculated the density. But while the planets might be similar to Earth, TRAPPIST-1 is extremely small by stellar standards, being only 9 percent as massive as our Sun. In turn, this means that it’s much cooler than our star, and in order for the planets to have Earth-like temperatures, they’d first need to be much closer to the star. This has indeed been confirmed by observation, as several of the planets lie closer to TRAPPIST-1 than Mercury to the Sun. In fact, a couple of them are actually much more illuminated than the Earth, while another planet, Trappist-d, matches Earth near-perfectly in terms of illumination. This graph presents known properties of the seven TRAPPIST-1 exoplanets (labeled b through h), showing how they compare to the inner rocky worlds in our own solar system. Credit: NASA/JPL-Caltech. The fact that the planets have up to 5% water is also an intriguing sign, especially considering that on Earth, water accounts for only 0.02% of the planet’s mass. However, just because these planets have the right density, structure, and distance from their star, doesn’t make them habitable. It makes them potentially habitable, which is a big distinction. “Densities, while important clues to the planets’ compositions, do not say anything about habitability. However, our study is an important step forward as we continue to explore whether these planets could support life,” said Brice-Olivier Demory, co-author at the University of Bern. This illustration shows the seven Earth-size planets of TRAPPIST-1. The image does not show the planets’ orbits to scale, but highlights possibilities for how the surfaces of these intriguing worlds might look. Credit: NASA/JPL-Caltech. For instance, we have no idea how their surfaces might look like. Mars and the Moon have quite similar densities, but they look completely different. It’s tantalizing to think what the surface of these planets might be like, but for now, we just don’t have enough information to make any assumption. The next step will be using NASA’s James Webb Space Telescope to figure out whether these planets have atmospheres and if yes, what these atmospheres are like. 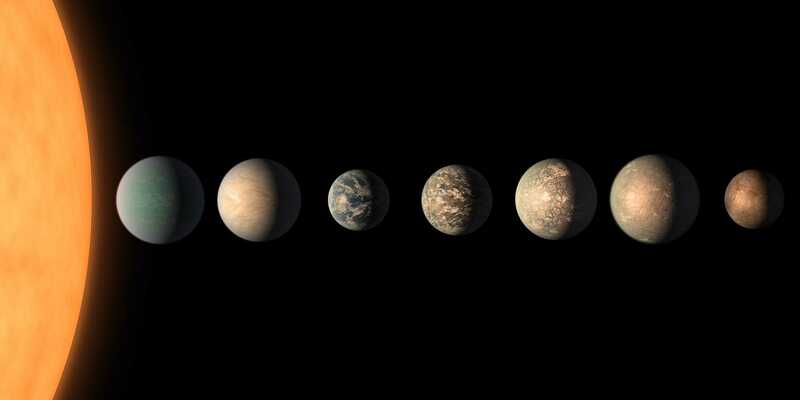 “Our conceptions of what these planets look like today may change dramatically over time,” said Robert Hurt, senior visualization scientist at the Spitzer Science Center. “As we learn more about these planets, the pictures we make will evolve in response to our improved understanding. Journal Reference: S. Grimm et al. : The nature of the TRAPPIST-1 exoplanets, Astronomy and Astrophysics, 05.02.2018, in press.